When used over door and window openings, ACS Azure brick faced lintels remove the need for Masonry Support and artisan bricklayers. Azure lintels speed the construction process and also guarantee a seamless blend of masonry to the installer. Azure lintels are lightweight brick faced prefabricated units that are manufactured off-site. ACS supply to the project with brick slips resin bonded to the surface. The lintels achieve a unique high-performance bond in a controlled and uncontaminated factory environment. This advanced adhesion technique ensures that our product delivers unrivalled performance while also eliminating the potential failures associated with other methods. Azure products undergo the ultimate in testing; resulting in our system being unaffected in the most extreme weather conditions for the life of the building. We produce all our standard brick slip lintels in either 304 or 316 Stainless Steel. Although we also supply a budget galvanised option. Semi-skilled construction operatives effortlessly position the brick-faced lintels, therefore removing the need for artisan bricklayers. On average installation, times are reduced by 90%. The same batch of bricks used on site produces our Azure lintels, allowing them to arrive in one piece. Therefore you can achieve a perfect match, blending the Azure brick faced lintels seamlessly with already constructed brickwork. A fraction of the price of site-based construction. Labour costs reduced significantly by pre-fabricated off-site. 50% lighter than the most traditional solution. 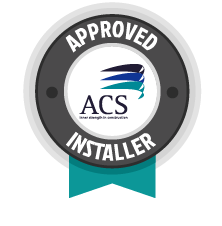 Installed as quick and easy as a standard lintel. A full range of feature lintels is also available.